An obese 49-year-old man is being treated in the ICU for severe bilateral pneumonia. He has been on femoral-femoral VV ECMO for the past 24 hours. The pump blood flow is 5L/min and fresh gas flow is 8L/min. He is ventilated with SIMV PC 15 cmH20 PEEP 15 cmH20 with unchanged tidal volumes of 20ml. His observations are HR 125/min, BP 90/50 mmHg on 0.6mcg/kg/min noradrenaline with oxygen saturations (SpO2) of 82%. Q1. What initial ECMO circuit checks should be made? Is the oxygen attached and running? Is the ECMO gas flow FiO2 1.0? Are the access and return cannula tips 10cm apart? Is colour difference seen between access and return lines? 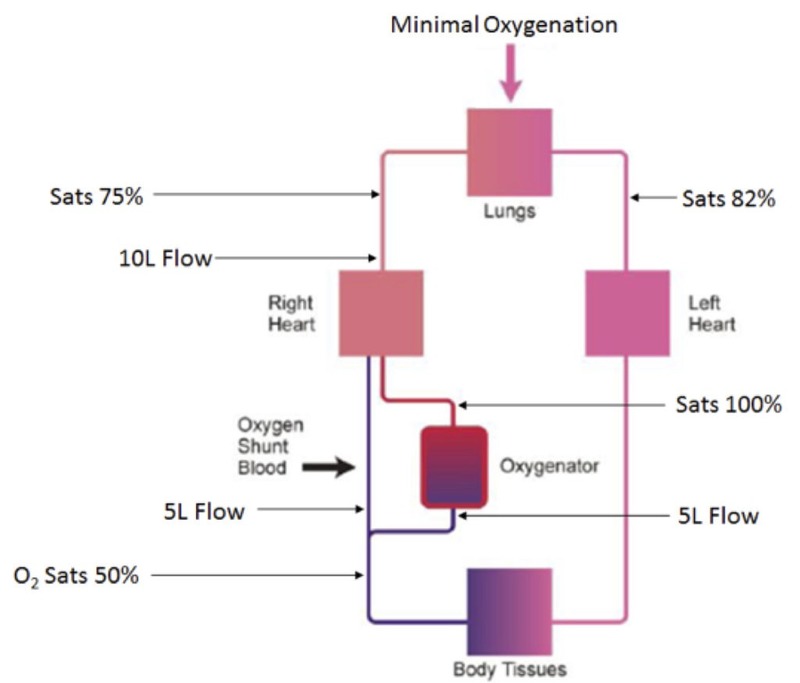 Is the pre-oxygenator oxygen saturation appropriate? Pre-oxygenator saturations are 50%. Post oxygenator pO2 is 450mmHg. An echocardiogram is performed revealing a hyperdynamic LV with mildly impaired RV. The estimated cardiac output is 10L/min. The return cannula is seen in the RA with the tip of the access cannula 10cm lower in the IVC. Q2. Why is the patient still hypoxaemic? The patient’s overall oxygenation results from contributions from both the ECMO circuit and the lungs. If the lungs are having a negligible effect on oxygenation the patient is almost entirely reliant upon the ECMO circuit for gas exchange. 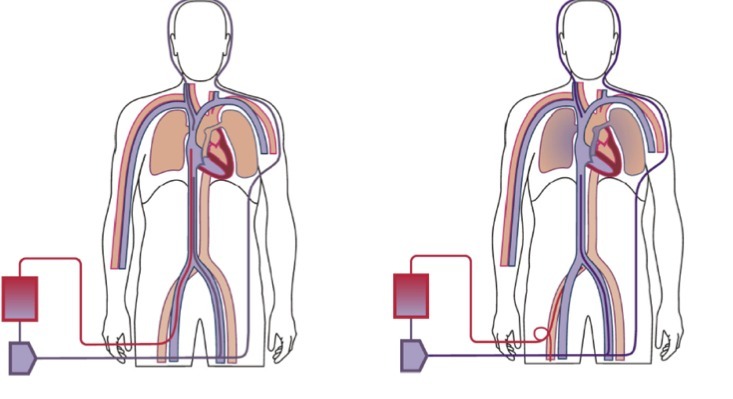 5L of blood per minute is passing through the ECMO circuit and is returned to the circulation fully saturated. However, the patient’s cardiac output is 10L/min, meaning 5L (50%) of blood bypasses the ECMO circuit. The lungs are failing and therefore have impaired ability to oxygenate blood, meaning 50% of cardiac output passes through to systemic circulation with minimal oxygenation. Figure 1. 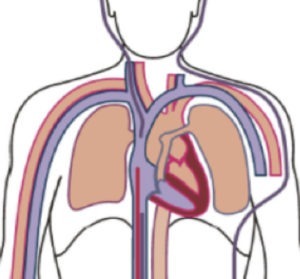 Schematic diagram describing the degree of blood oxygenation at different site’s of the patient’s circulation while on VV ECMO. Q3. Increasing the pump speed leads to ‘kicking’ of the access line with no increase in pump flow. What are the options at this stage? There appears to be little recruitability in this patient and little room to move whilst maintaining lung protective ventilation. More aggressive ventilation is likely to result in worsening ventilator-induced lung injury. Treatment should focus on the patient’s underlying condition. A negative fluid balance should be targeted however access insufficiency and high noradrenaline requirements may limit this. Consideration should be given to nitric oxide therapy, proning and alternative ventilation strategies such as APRV, however, none of these measures are likely to lead to rapid improvements in the patient’s condition. Increasing sedation, paralysing and cooling the patient will help to reduce the patient’s oxygen demand. These interventions may also allow pump flow to be increased. However, they are associated with side effects such as weakness, delirium and increased risk of infection. β-blockade could be used to reduce the patient’s cardiac output thereby reducing the proportion of “shunted” non-oxygenated blood reaching the arterial system. However, this may not be advisable in this case as the patient is hypotensive on high dose vasopressors. The role of β -blockers in sepsis is controversial (see the LITFL CCC entry on Catecholamines, Beta-blockade and Critical Illness). It is unclear what degree of hypoxia is acceptable in such patients, the ARDSnet trial targeted pO2 55-88mmHg and Sats 88-95%. Subnormal oxygen saturation targets in ARDS patients is associated with long-term cognitive impairment (see LITFL CCC entry on Oxygen Saturation Targets in Critical Illness). Importantly, a high cardiac output with lower saturations may result in a higher DO2 than a lower cardiac output with improved oxygen saturations. Inserting a second access cannula will allow high pump flows whilst avoiding the problem of access insufficiency. Oxygenation is improved without the need to decrease cardiac output. Q4. What are indications for high flow ECMO circuit configurations? Q5. How will switching to a high flow ECMO circuit configuration improve this patient’s oxygenation? Q6. How is the conversion to a high-flow configuration made? Figure 3. Photograph of y connector in high flow circuit. The patient is out of shot on the left and the ECMO circuit is on the right. Q7. Explain the difference in colour between the blood from the IVC access cannula and the SVC access cannula in Figure 3. The blood from the SVC access cannula appears lighter as the oxygen saturation is greater than the blood entering the IVC access cannula. This is a result of recirculation of oxygenated blood from the return cannula. 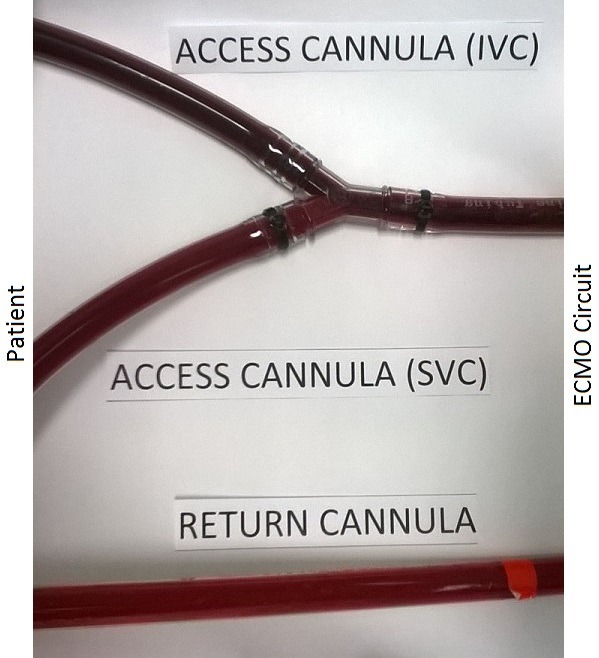 The relative positions of the three cannulae seen in figure 4 demonstrate how the return cannula may direct oxygenated blood toward the SVC, leading to the SVC cannula having a greater degree of recirculation than the IVC cannula.